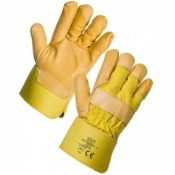 With knuckle protection and a vein patch providing the user with peace of mind when handling unknown or potentially dangerous objects, the Silverline Pigskin Rigger Gloves 868554 are a great choice for general tasks and construction work. 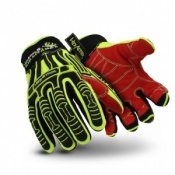 The product code for these gloves is 868554. Featuring a safety cuff, the Silverline Pigskin Rigger Gloves 868554 protect from any dirt getting inside the glove ensuring the gloves last longer and hands are protected and kept clean, ideal for use when working in environments around dirt, and in outdoor workplaces. The Silverline Pigskin Rigger Gloves 868554 are made from top quality soft pigskin for added comfort during wear. 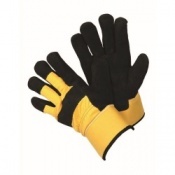 The elasticated back to the gloves ensures they can fit easily and comfortably over garments. A great all rounder glove that is lightweight, the Silverline Pigskin Rigger Gloves 868554 allow the user to carry out general handling jobs as well as more awkward and intricate tasks where full dexterity is required. 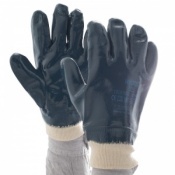 The Silverline Pigskin Rigger Gloves 868554 are supplied in a universal size Large that should fit most wearers. 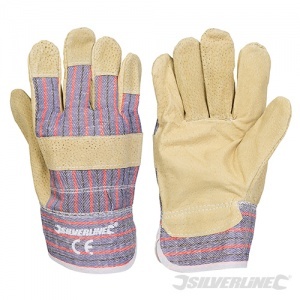 The Silverline Pigskin Rigger Gloves 868554 are supplied in pairs.